Watching a Live performance from accomplished bassist Leo Brooks is a such treat. 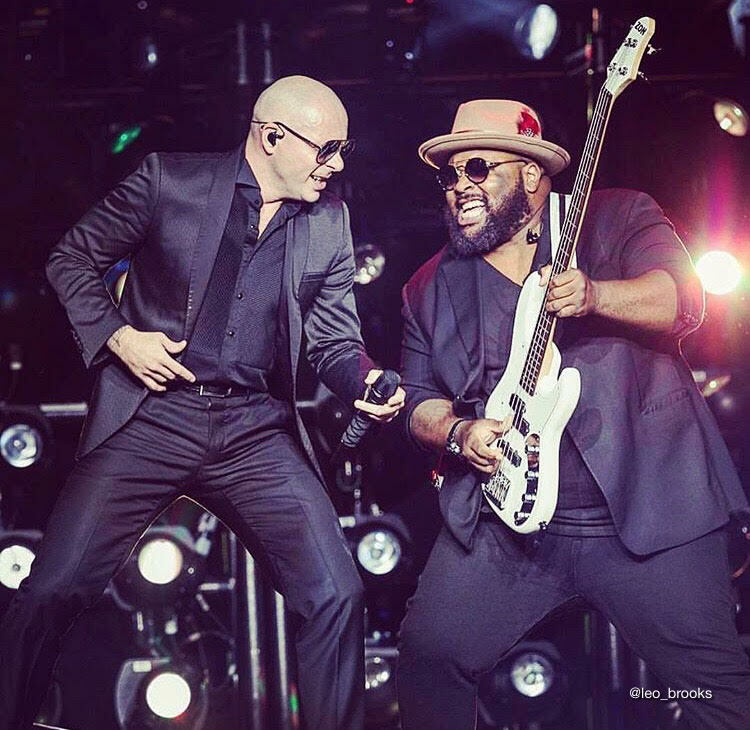 What Leo does with the bass guitar is what Pitbull does to rhymes. Locks you in with 100% engagement with his skills, energy and vibe. 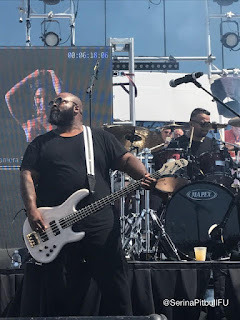 With his strong onstage presence and connection with the crowd felt. 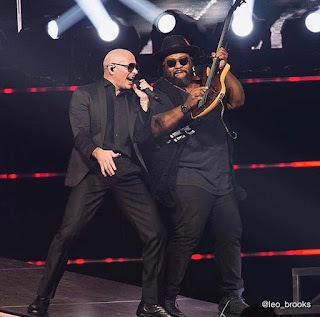 Even Pitbull gets in on the act with those signature air guitar session moments on stage together! 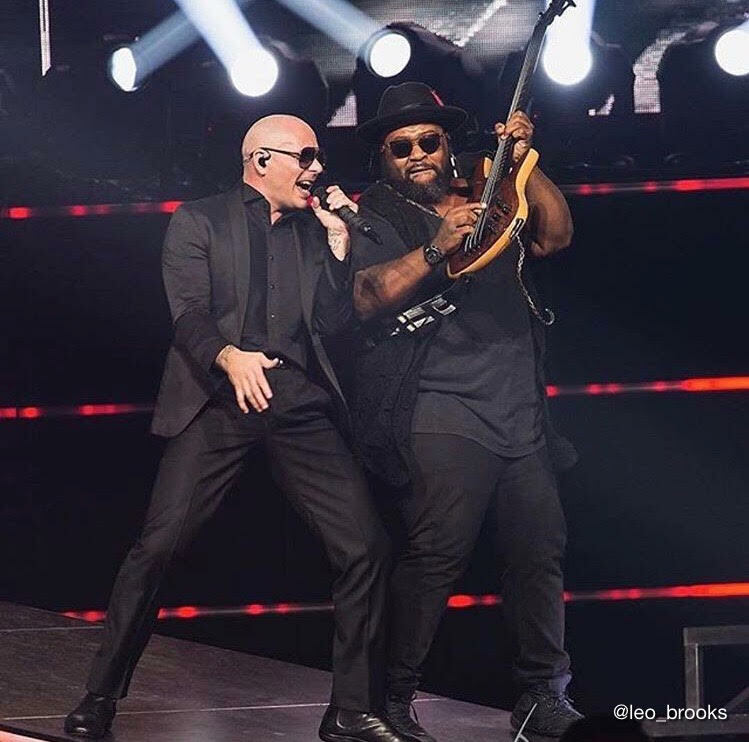 While spinning around the globe from stage to stage with Pitbull, the incredibly talented bass guitar player Leo Brooks is causing just as much a string of waves and amping up the bass outside of this as an artist, co-producing, writing and knocking out hits along with other performances around Miami and future surprises around his own and a new Pitbull album. An all round creative genius. It was a pleasure and honour to be able to talk with the hardworking, talented, warm, humble and so down to earth Leo Brooks. 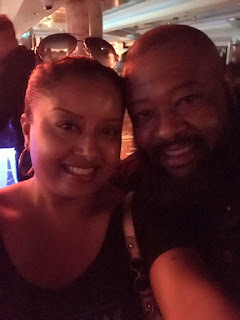 Leo talks about his latest and upcoming single, Pitbull, other productions past and future and a whole lot more so without any spoilers read on! Hi Leo, Thank you for taking the time to talk to me and sharing more with us. First of all, congratulations on your latest single Hot.Sweat.Wet. I’ve had it on repeat! How did this great song come about? First off thank you for the opportunity, and when I came up with this song it came from a jam session that I put together and recorded in Miami with my friends (Cat Shell, Lucian White on vocals Jesse McGinty on saxophone, David Chiverton on drums, Papayo on percussion, Dwayne Bennet on the Keys, Chad Bernstein on Trombone, Roosevelt Collier on steel guitar and Dener Ciede on guitar) Every song that I'll be putting out with this style will all be coming from this jam session. Everything was made on the spot -Just one take! Wow, that’s pretty impressive! What did you want the listeners to take away from the single? At the time it felt like a summer vibe. In Miami there’s a lot of rain along with sunshine. It’s hot, sweaty and also wet along with a cool vibe. Thank you! I have another one (single) coming out. It’s called SUGA. That one is going to be on fire. It will be coming out soon. I’ll keep you posted. Absolutely thank you! I hear you have your own new album on the way? Is that right? Yes there is! I don't have a date yet but I’ll let you know. Ok alright, we’ll talk more about that soon? Speaking of albums, what albums did you grow up listening to? Earth Wind and Fire, Bob Marley, Jimi Hendrix, Nirvana, The Beatles. A whole mix. I grew up with a lot of them! (laughs) Just good music. Country music like George Jones and Hank Williams. It’s all a mix. I think when I was in Elementary. I knew I wanted to be in the Arts. That was in my head since I was a little kid. Even before I was playing the guitar I knew I wanted to do music and the Arts. Did you have anyone in the family that was musical? Yes my dad, he plays the guitar enough to be able to teach me. Do you both still jam together, you and your dad? Oh yes we definitely jam together (laughs) My dad loves it when I come over and jam with him. With him I play a lot of Country. So many, Bob Marley is definitely one of them - the positivity. That’s why I like Pit so much, he’s so positive all the time and hard working. I learn so much from him just being around him all the time. A great guy and also a friend. I was part of Manos Pa’rriba (Echa Pa’lla). Me and Papayo wrote it with Pitbull. I have another four to five songs coming out on Pitbull’s upcoming new Spanish album. You guys are going to love that one! Coming out next year first or second quarter. I’ve also worked with Frito Blanko, Fuego and Sensato’s Que Lo Que on Pitbull’s Dale the Album - That rhythm is called Punta! You’ve been around quite a bit working away! Sounds like it, just like the ‘Boss’ hey! Are there any other artists or musicians you would like to collaborate with? Ozuna for sure, on the Spanish side. On the English side I’d love to work with Rihanna and Taylor Swift - she’s a great songwriter, performer and all rounder. From being a bassist, expanding to co-producing, being an artist and writing - what is it you enjoy the most? Between what seems like non-stop shows, how do you find the time to create and produce in between? Whenever I get to my hotel room that’s when I start. I’m looking at my laptop and little set up right now as I’m talking to you and getting it ready to start working. Anytime between the stage and sound checks, I’m working. While everybody else is sleeping you got to work. It’s the only way you’re going to get ahead. 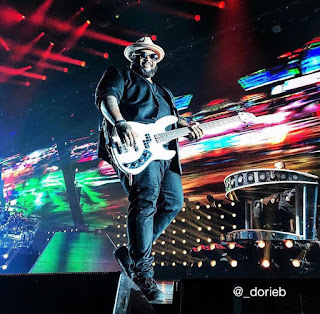 Do you have a particular guitar brand or piece of equipment that you like to use on stage? The bass I like to use is ZON. Going back to family, you and your brother artist Alejandro Brooks wrote and performed a song together for your mum on Mother's Day in church together, how old were you? Oh yeah (laughs) how do you know about that? I was eleven years old that’s the first song I wrote for my mom especially for Mother's Day. Can I persuade you to give us few lines…? No one can replace you Ma….. It sounds REALLY busy being Leo Brooks to say the least! How do you unwind and relax? …And I see you’re also a bit of a fisherman! I’ll let you get to the ocean very soon! But if the Pitbull Girls were coming round for dinner what would be on the menu after a day's catch, Leo? Nice! Back to Mr Worldwide, Pitbull is full of wisdom. Is there any valuable advice he has shared with you? Always have vision, to believe in your dreams, never give up and try to outwork everybody. Thank you, for me too. And you get to do it almost every night! Do you think he might be ready to handle your guitar for real sometime? We’ll just have some extra guitars and give away one to him. You got to make sure Pit’s trained properly or he’ll mess up your set - I’m just kidding! Are there any funny or disruptive situations encountered on tour with Pitbull? (Laughs) This one time we were in Spain and I was sleeping and these guys decided to get a room key to my room and get a huge bucket of water while I was sleeping and just threw gallons of water on top of me! I went crazy on the Bell Man, I made them replace the whole bed, I said “why did you give them a key! ?” But I got them back. I was sleeping so good and the next thing I knew I was completely soaked! Oh! What! When you say ‘these’ guys? Who are ‘these' guys? The Agents? Moving onto the next question, is there a pinnacle moment in your career so far? Winning the Grammy with Pit. When we won the Latin Grammys for Best Urban Performance for Echa Pa’lla (Manos Pa'rriba) in 2013 and then the English Grammys 2016 for Best Latin Rock, Urban or Alternative Album for Dale the album that was crazy! I know there’s more to come. There’s a couple of more shows coming up and then a couple more one off shows and after that we start working on Pitbull’s new Spanish album that’s coming out and start knocking out more songs. December is a recording month for the team and Pit. Muévelo Loca Boom Boom ! BoOm! Can’t stop, won’t stop playing Pitbull’s new single Muévelo Loca Boom Boom. The snippet of the song had me hooked since October when Pitbull teased us a few months ago at the Latin American Music Awards, craving to hear more! A much welcomed assault and loss of control of my hips and invasion to the ears from all directions straight off from press play! 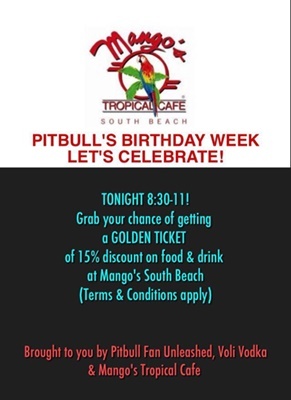 From being a dancefloor filler as Pitbull says “All up in the club like..” To being staple in recent Zumba choreography, here’s hoping it’s heard somewhere on the ocean between Miami and the Bahamas on the Pitbull Cruise 2018 too. Single cover a Pitbull ripping off the bikini bottoms to bare that culo – very fitting! A 'Greatest Hits' album typically consists of old reasonably 'aged' songs. Yet this Bad Man made his own 'playbook with no rules in it' and switched that up by adding fairly new Jungle and then Locas - another upbeat song with a collaboration with Lil' Jon to long standing fans delight. Some may argue that it's an 'unfinished' Greatest Hits album as there are so many iconic great hits spinning back to the M.I.A.M.I and Rebelution era in particular, another side may point out that the Greatest Hits album speaks to a broader and 'party fuelled' audience. Either way it's packed with hit after hit to dance down memory lane. Greatest Hits? 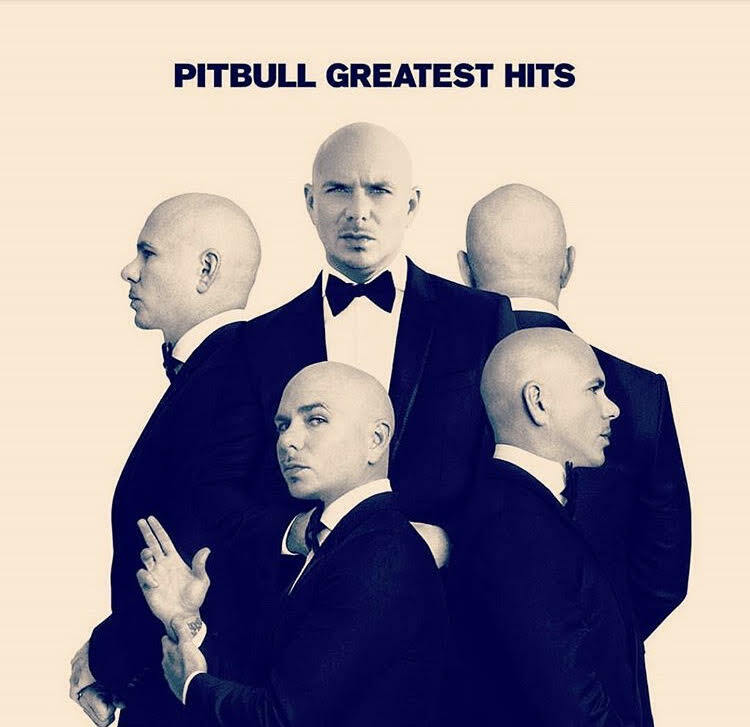 Pitbull Greatest Party Anthem Hits! Dale!